Hi guys! No review or lengthy post today, just a quick hello to introduce you to a fabulous new project that I am super excited to be a part of. 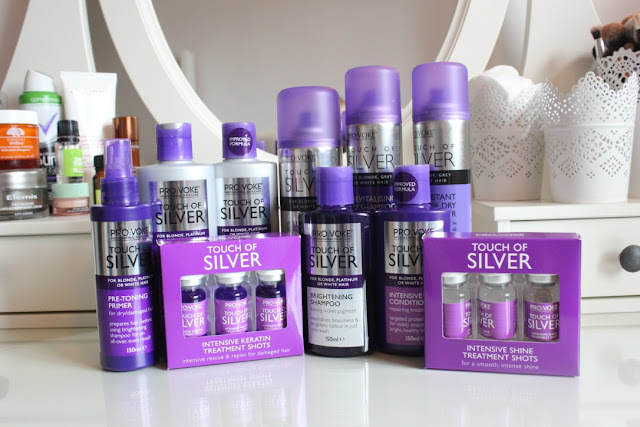 Touch of Silver have come up with a new tribe of wonderful bloggers called the VIB Tribe, Very Important Blondes. I partially feel as though I'm cheating the system as I am technically a "dirty blonde" or a "bronde" however I think it'll be a good slant on the project to view it from my point of view. 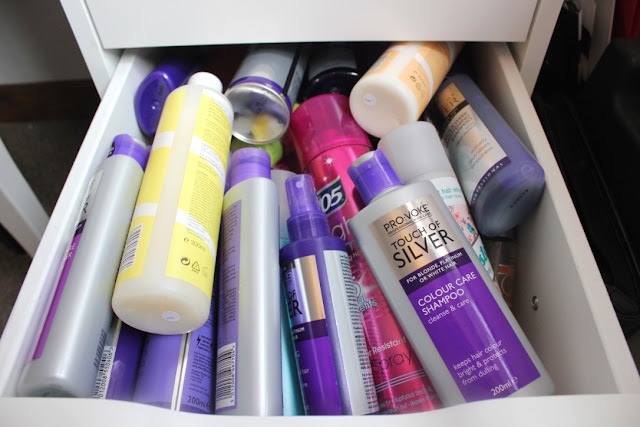 As you can see they've already sent me bundles of goodies to try and review for you guys so watch this space for plenty of blonding products coming your way! I didn't realise that their range was quite so vast so I can't wait to get well and truly stuck in to this little lot and see how I get on. I always, always struggle with brassiness in my hair no matter what I do so I'm hoping that somewhere in this little lot is the solution to all of my woes. Are you part of the VIB Tribe? Leave me a comment below if you are, I'd love to meet you all! Stila Stay All Day Liquid Lipstick £15 - When I first tried one of these lipsticks back when I used to work for Stila, I'll admit I was a little bit dubious. They are very matte once they've dried and I usually have pretty dry lips so I wasn't sure that they'd work for me. I think because they're so thick, it doesn't actually matter what condition your lips are in as these will basically coat them completely. Now a word of warning, these are not for the faint hearted. They dry very quickly and very matte, so once you've applied you need to just let it do it's thing. If you try and smudge them once they've set then it just tends to peel so you really have to get used to leaving your lips well alone once you've finished them. The colour is bold and you need to be able to create a really sharp line, there's no room for errors, I always use a lip pencil to draw myself a bit of a guide to work up to and I always use a brush as you can be far more accurate. The lasting power of these is insane, they wear a little on the inside of your lip if you eat or drink but this can be touched up easily. The bulk of this will last perfectly until you take it off at night, I have fallen asleep with this on (oops!) and woken up with it perfectly in tact in the next morning, it was a very strange look trust me. For £15 I think that they're pretty good value for money, it looks as though you get a lot of product and you don't need a lot to create a full and powerful look. They do come in more neutral colours but due to how thick and matte they are, I think that it works a lot better in the darker shades. It feels like velvet when you first apply it and I'll reiterate that you have to just leave it to work it's magic and set. Once it's done that then it isn't going anywhere. It also smells beautiful, it reminds me of vanilla. Not something that I usually look for in a lipstick but it's lovely nevertheless. Overall I think that these are great if you want to start expanding your collection and try something a bit different. I have Patina, a dark neutral colour that is the one that I reach for the most, with a simple catflick and a slick of bronzer this makes for a super "vogue" look. Beso is the bright red that looks fantastic with a smokey eye to create a really bold look and a vibrant red lip that will last all night. My third one is Aria, a dark almost plum colour that will come out to play again next autumn, it creates a fantastic vampy lip than even I feel comfortable in. I definitely like to keep my eyes simple with these as the colour is just so intense but sometimes it's nice to have the focus elsewhere. Chanel Vitalumiere Aqua £33 - I'm not actually sure whether or not I've done this review before as this was the first ever high end foundation that I bought. I can't see to find it in my archives but it's strange to think that I've never thought to mention this to you all! When I first started blogging, or really taking my makeup seriously, the thought of wearing anything other than full coverage seemed both strange and scary to me, why would I ever choose to wear a sheer coverage foundation?! Eventually after a long battle of finding the right skincare routine for me knowing what I can get away with depending on how tanned I am, I finally came round to the idea. I figured that a high-end offering would probably stand me in better stead than a high street version given that it was my first ever foundation that didn't promise an airbrushed look. I actually remember the day that I got my first ever sample of this and I'll be honest, I think I had it applied to my face fully and another sample before I actually took the plunge, at £33 it's not the cheapest of foundations and it's not one that I wear every day. I'll just make this statement right here: if a brand is willing to give me a generous sample then I am 100% more likely to buy the product in the long run. I will never, ever fork out for a foundation over £10 without a good sample and the chance to wear it in differing situations and after wandering around Selfridges in London for a good half an hour, the fact that the lady on the counter was so easy to talk to and so happy to offer me a sample, even though she knew there was only a slight chance I'd actually go back to her personally to purchase it, is what made me buy this eventually. I was really unsure about a sheer coverage foundation and I needed my time to see if I could make it work for me. After then having it applied in Debenhams, Nottingham with the rest of my makeup I was 99% sold as it just gave a really nice, luminous finish that honestly just looked like my skin only better. I did want to just try my hand at it myself as, as an ex makeup artist, I know that it's very easy to make a foundation look flawless when you know all of the tricks of the trade and how that particular one works best. Not long after I went back to that very counter in Nottingham (which is not my nearest Chanel counter by far) and very proudly purchased it. Admittedly, it doesn't give much coverage at all and this only makes an appearance on good skin days, however I've noticed lately that on weekends I like a much fresher look and especially with summer almost upon us, provided I've had enough sleep the night before, then this is all that I need. I'll hold my hands up and say that it actually takes me longer to do my makeup with this as I find I want to put that bit more effort into all of the other bits and bobs however I think that may be down to a lack of experience with creating a no makeup makeup look. The application of this one also goes a little bit against the grain in that you are actually supposed to apply it with your fingers, you shake the bottle and then pop a little bit on the back of your hand before applying it to your face with your fingertips. I always make sure that my hands are squeaky clean before doing this for hygiene reasons and I can testify that it just doesn't work as well with a brush. I also find that you can then go over any areas a bit easier that may need a second touch up. I revert back to my brush when putting on my concealer though. Hey guys! 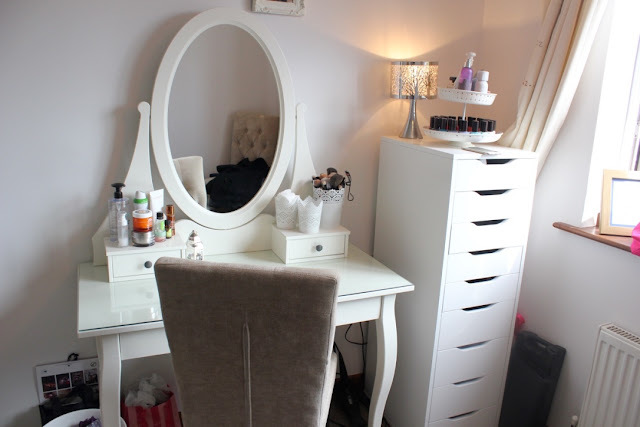 I hope that you don't mind the crazily photo heavy post, I honestly think I've been waiting for the past 3 years to have my perfect dressing table and makeup storage so naturally I couldn't wait to show it off to you all! I'm hoping to make this into a YouTube video as well so watch this space. 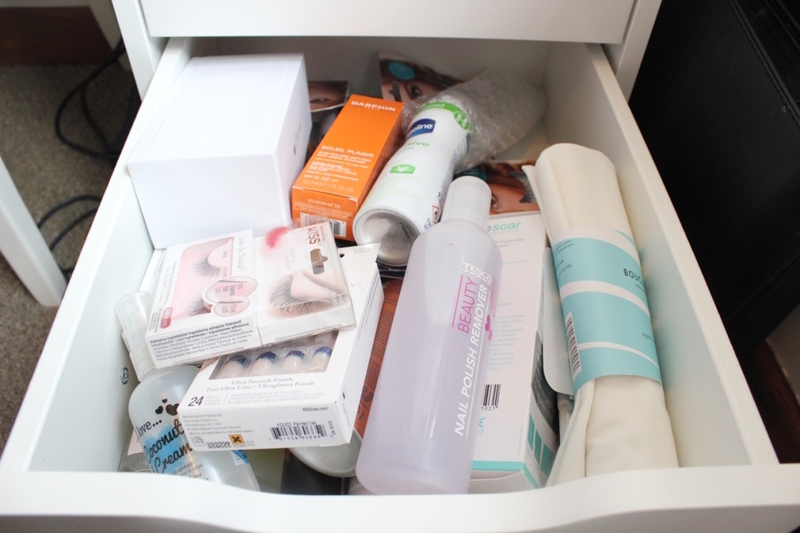 First up we have all of my daily skincare products, obviously my cleansers are kept in the bathroom so they don't feature however I generally sweep over my skin with my Sephora Micellar Water before applying my GinZing Moisturiser and finish off with my Clinique All About Eyes. At night time I do the same however apply the Avene Soothing Serum with a few drops of tea-tree oil mixed in and follow up with my Elemis Night Cream. There's also my Moisture Rich Body Lotion and their Clarins Radiance Plus Golden Glow Booster than I always apply when I have time. Lastly, there's the Macadamia Healing Oil that I just tussle through my hair once I've finished styling it. 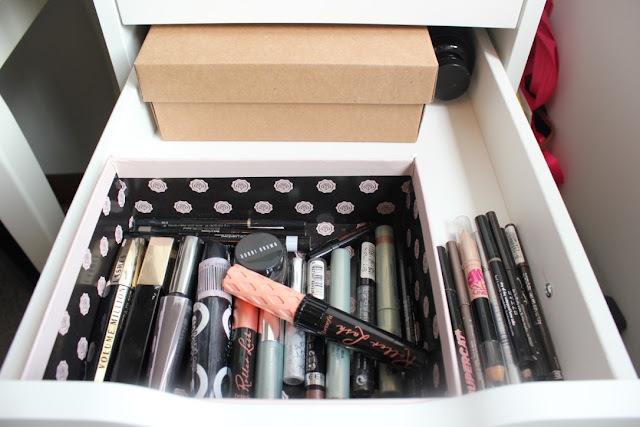 On the other side I have all of my brushes (that are desperate to be cleaned!) as well as my cotton buds and cotton pads. 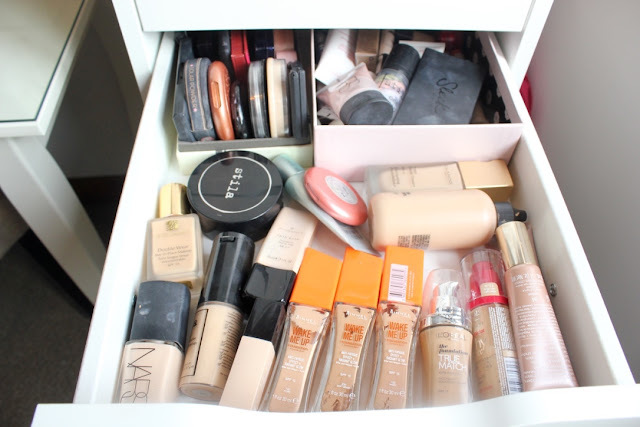 I go through so many of these so I always need them close! Next we have one of my most favourite pieces in the house which is this cupcake holder that I have transformed into my Nail Varnish Storage, since moving in I've actually thrown out all of my other Nail Varnishes so I genuinely only one Soigne now. They're the best quality that I've ever found and I really love how cute my collection looks now. I have over 30 and counting, I just need them to release some new ones now! 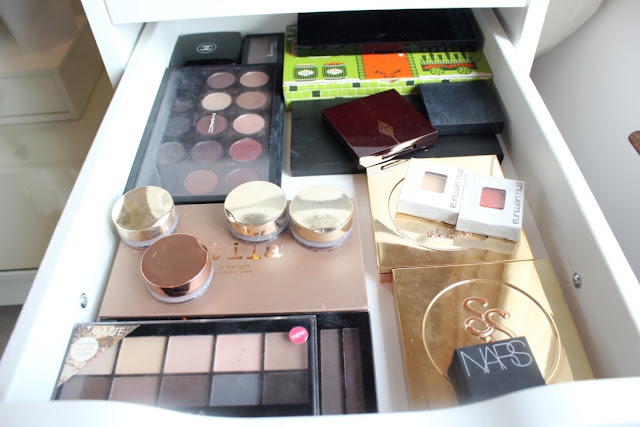 It's so handy to have them like this though as I can see them all and find exactly what colour I'm looking for. On the top of that is where I keep my rather limited perfume stash. I'm not really a huge perfume lover so I can never justify splashing the cash however there are a few I have my eye on. 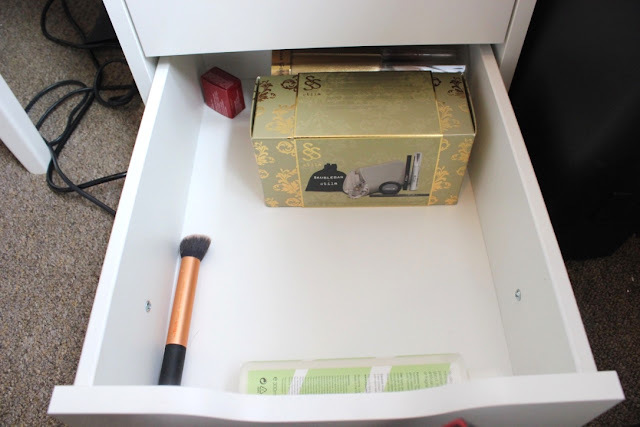 Next up is the Iconic Ikea Alex Drawers, these made James' eyes water slightly when he realised they were solely for my cosmetics collection but honestly they're so handy. Each drawer contains a different part of my collection and it's so handy having it all laid out for me to see easily. I like things having a specific home in my house so that I know where to put them away so this is great to soothe my organisation woes. 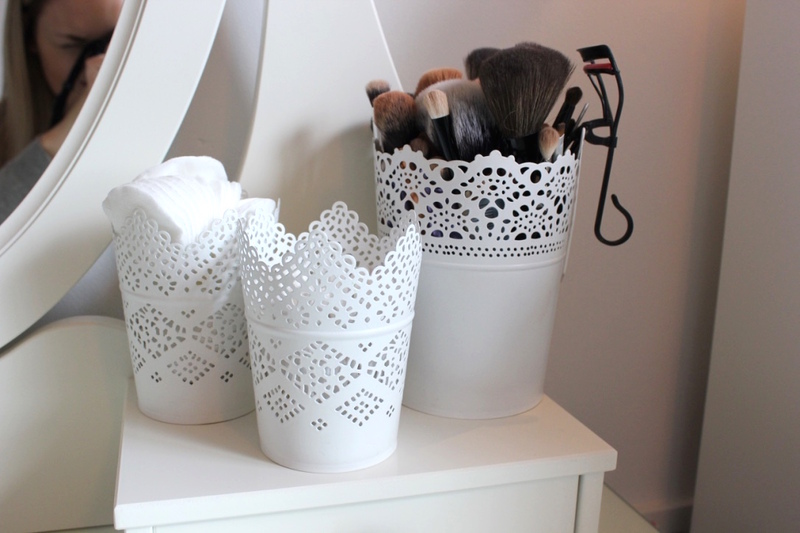 They were certainly worth the investment and it's now my challenge to fill them! Garnier Micellar Cleansing Water £2.79 - Ever since Micellar waters hit the mainstream a few years ago, I have been obsessed with them for taking off my makeup. Nothing else seems to compare now and although I only use them as my sole cleanser when I'm being lazy or in a rush, they are perfect for me to quickly remove my makeup before doing a deeper cleanse. I have tried my hand with a few different Micellar Waters, I'm yet to try bioderma in anything other than a miniature size however I did pick up the Sephora offering when in Barcelona. Why am I mentioning that in a post about the Garner version you might ask? Because quite simply, this one is better. In every #bbloggers chat I seem to find myself recommending this over and above any other product and the only downside to it is that the Sephora version has a really handy pump! I will, however, be dispensing this beauty into that once I've finished all of the Sephora one up. This leaves my skin feeling squeaky clean and I have no qualms in leaving my skin at that and popping my moisturiser on over the top. I do mostly cleanse further after using a hot cloth cleanser however it doesn't feel like a necessity, more of a luxury. This removes even the most stubborn of mascaras (Benefit's Roller Lash, I'm looking at you here...) with absolute ease and in just three cotton buds (one for each eye and then one for all over, of course) all of my make up is removed. I find that I can remove my makeup in much less time when using this and whereas I'd often have to scrub at my eyes a little, if I simply hold this over them for 10 seconds and then wipe away, 99% of my mascara and eye makeup is gone and I only need to do a tiny wiggle to get the rest. At only £2.79 at Boots, you need to go and snap this up, what do you really have to lose?! It's usually £4.99 I believe and even at that it's a bargain, outweighing it's must more expensive components it's by far my favourite dupe of 2015 so far. It's less soapy than Sephora and more luxurious than L'oreal. I found that because the L'Oreal version had a fairly flimsy flip lid and it just poured out, that I had about 3 occasions where it leaked all of my makeup bag when travelling, however the cap on this is much sturdier and it doesn't seem to pour out quite as easily, meaning that I don't hold my breath every time I unpack it to see what damage it's caused. This is one that I'm sure I will repurchase over and over again, although I think I'll always transfer it in to the Sephora holder purely for each, I think I'm now fairly sorted when it comes to my makeup removal technique. Clarins Radiance-Plus Golden Glow Booster* £26 - One thing that I think we all strive for at this time of year is a lovely golden glow, some go for a deep bronze whilst others want a more subtle hint of colour which is the perfect thing about the Clarins Radiance-Plus Golden Glow Booster. You have all of the control over your colour. It's a gradual tan that you mix in with your moisturiser, meaning that you can really nourish your skin whilst adding a touch of colour. I personally prefer to really know I have a tan when I've applied something and so I use around 5 drops of this in with my Moisture Rich Body Lotion and I find that even after one application my legs look more polished however if I really want to build up some colour I'll start using this at least 3 days in advance. The absolutely great thing about the Golden Glow Booster is that you genuinely can do pretty much what you want with it to create the colour that you want, one week I was pretty tanned already so needed to build up quite a deep colour so I used it every single night for 5 days and then in the morning and evening for the day before a wedding. Yet the other week it was sporadically sunny for once and a single application was enough to boost my confidence and give me the smallest hint of colour. You can see the colour build day-by-day enabling you to stop once you've achieved your desired colour or keep applying until you get there. One thing I hate about fake tan is the nervous wait the next morning to reveal your place on the golden goddess to oompa loompa spectrum, I find that most tans are either not dark enough or far too dark or worse still, streaky and patchy! By building it up gradually there's no anxious wait to see how it'll turn out, you can simply wake up, assess your colour and you decide whether or not to apply any more. It also fades just as evenly as it builds, you can barely see it fading away (until you wake up one morning looking like casper once again) which means that should you suddenly need to start reapplying, you can do without worrying it'll go patchy. Another fab thing about the Golden Glow Booster is that it really encourages you to moisturise, I find that it gets me into a nice routine of moisturising as soon as I get out of the shower. It gets me into the mindset of actually looking at my body (something that used to terrify me) and assessing whether or not I want to add a little colour, and straight away I'm reminded of my need to moisturise. Even without using this my legs have never looked better just due to my moisturising. I only ever used to moisturise my legs if I was A. Wearing a skirt or B. Planning on fake tanning the next day, whereas now I keep well on top of it at all times, I've even noticed that my stretch marks and other lump and bumps are starting to bid farewell. For £26 this will last you absolutely ages, I've barely noticed mine go down and although I'm no party animal, I do like to have a bit of colour on me most of the time. You only need a minimum of three drops mixed in with your moisturiser and they predict that if you do so daily it will last you for 3 months. I've had mine for 2 months already and as I just said, I've still got about 90% of it left. I've only used this on my legs so far however it is safe to use on your face also, although if memory serves me correctly I think that they do a specific face one as well. This will see me right through summer and hopefully well into the Autumn and once it's gone, I shall most definitely be repurchasing as it's so handy and is my perfect tanning product. Origins GinZing Energy Boosting Moisturiser £23 - I've heard a lot about the Origins GinZing range in twitter chats and on some of my favourite blogs but for some reason I've never really taken the plunge myself, I got into the Origins Masks last year and have been loving those so when I looked around my skincare stash and realised I've never actually invested in a good moisturiser, I decided to stop by my local Origins counter to see what they had to offer. I wasn't totally expecting the woman working there to suggest this as, if I'm honest, I thought it was only the eye cream in this range but when she said it was light but would still give my combination skin enough moisture to keep it from being dry then I was sold. Although this normally retails at £23 for 50ml, they have an offer on for a 75ml pot which I think was £32, though I may be wrong as it was about 6 weeks ago now! To me £32 seemed like a better buy than £23 and to be honest I haven't really noticed that I've used a lot in the 6 weeks that I've already had it. A little does go a long way and I just dab my finger in the pot and put one spot on each cheek and one on my forehead and that does the trick. 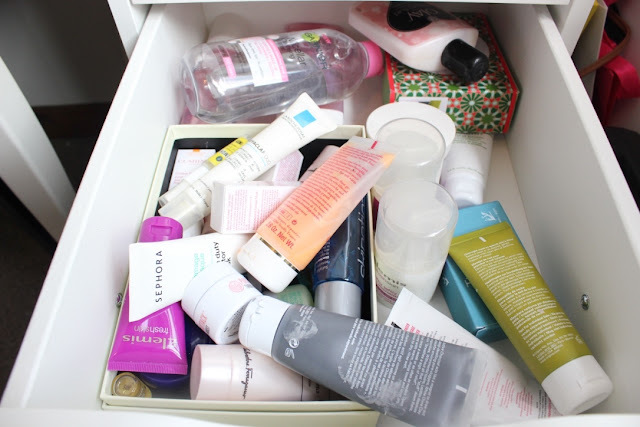 It soaks in super quickly which is something that's really important to me when I'm rushing around in the morning and is always something that I need to have in a moisturiser. When I went to the counter I was noticing that my forehead was going a bit "bumpy", like those spots that never really materialise into anything but just sit under the skin for a bit and make your skin look uneven. She suggested to me that the moisturiser that I was using was too rich for my skin and I was actually over-hydrating my skin which made sense because I was being really conscious that my skincare routine wasn't great so I was overcompensating whenever I did use anything. Ever since switching to this my skin has looked brighter and more awake and those dreaded lumps and bumps are long gone! 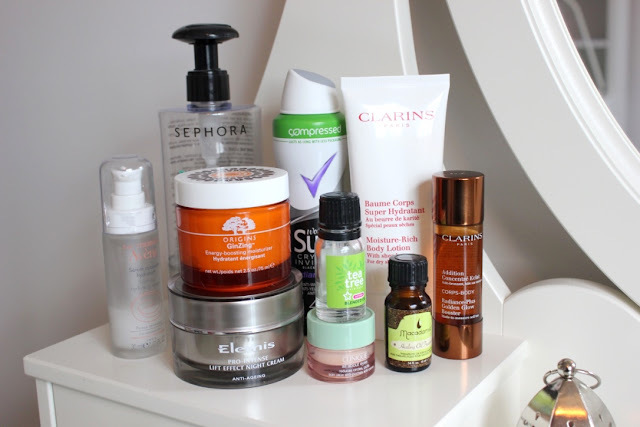 I was also advised to exfoliate more which I have been doing slightly but my friend from the Clarins counter once told me that I was exfoliating too much, so now I feel a bit piggy in the middle! I'm going to upload a post (and maybe a video?!) on m skincare routine soon so I won't say too much but I've started exfoliating whenever I wash my hair (ever 4/5 days) and my night-time cleanser has a really gentle, barely there exfoliant to it. Doing all of this has solved my problem and I feel like my skin is calmer and more soothed now so I am certainly very happy. Would I purchase this again? Probably! I'm a bit of a fiend when it comes to skincare and I like to try absolutely everything so it's rare for me to repurchase things, and this is lasting me so long already that by the time it's finished my little magpie self will have probably lined up something else to try. But I sit here firmly in the knowledge that this works really well on my skin and I can always rely on it to give the results that I want, so a repurchase is never out of the question. Makeup Revolution Highlighter Palette "Highlight" £8 - It always makes me laugh when I walk into any drug store, primark or anything of that sort and see something for slightly more expensive then their usual line, I don't think I'm alone in having a mini gasp of "gosh that's expensive" before coming back down to earth and realising that actually, compared to most brands I normally buy, it's still a ruddy good deal! This is one of Makeup Revolution's pricier items but it's still absolutely fantastic value when you compare it to it's £50+ dupe, the Hourglass Ambient Lighting Palette. I grabbed this in a 3 for 2 in my local superdrug as this is one of Make Up Revolution's product that I've actually had my eye on for a while but never been able to source. I'm really getting into my highlight now and taking time with the smaller touches with my makeup to make a big difference to the whole effect and this offers a fantastic range of colours depending on which type of "glow" you want. I tend to use "golden lights" for the inner corner of my eye or sweeping under my brow bone to give that touch of highlight and brighten up my eye area, if I'm going for a warmer look on my cheeks and have gone heavy with the bronzer then I'll use "peach lights" over my cheek bones and across the top of my brow bone to keep the warmer, bronzed look whilst adding my highlight to look really sun kissed. However when I'm paler and wanting a perhaps more everyday look then I'll turn to "Pink Lights" to boost my natural glow and simply add a bit of "oomph" to my look without changing it too drastically. The sleek black packaging looks as though it's far more high end and luxe than it actually is, which isn't let down by the quality of the product. There's no annoying glitter and as long as you use a light hand and don't go too overboard, there's none of that fake sheen that some less expensive highlighters can sometimes give. All three colours add a subtle yet effective "something" to my look and with these three shades, there's one for every single day. The only downside to having all three in a palette like this is that it's not the easiest to transport around if you know for definite what kind of look you're going to be after as, naturally, it is rather large. However now I'm (almost) firmly rooted into one spot in my new home it's found a lovely place in my new dressing table. Considering I was admittedly one of the sceptics when Makeup Revolution first launched, they're fast becoming a brand that I can't stop buying more of and are taking over my makeup collection rather rapidly! What else do I need to try?! 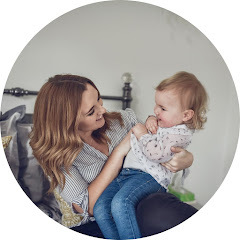 Does anyone read someone else's life update? Time will tell I suppose and who cares anyway, I wanted to write and document all of the changes that have happened recently as there's been a fair few! Sorry for the lack of photos, the house isn't quite finished yet and I want to show it all in one go once it's done and there aren't any photos about anything else. House. If you follow me on twitter you may know that I recently moved into mine and James' first home together. I have lived out on my own before but left all of that behind me when I decided to be with James and as such have been back at my Grandparents ever since so I am fairly desperate to move out. James has also been working away during the week for the past 19 weeks and we have just 1 more to go until he's back home to normality and I can stop pining for him constantly. I think we're both at a point where we're ready for our own space and a little nest for us to both come back to and be together after whatever the day has thrown at us and I'm really proud of where we've come. Although we're only renting we've been aloud to paint the house pretty much from top to bottom as it needed a refresh so it really feels like "our" home. He's been absolutely fantastic building mountains of Ikea furniture and my home is fast becoming everything I've ever dreamed of. I just can't wait until it's all finished to show you guys around and start using my beloved new dressing table. Job. I started my new job back in March and it's really taken me until now to find my feet, it's unlike anything I've ever done before and is pretty unique to that company and role. There are so many systems and screens to learn and it could mean mega bucks for the company if you screw it up so you have to have a pretty intensive training course for the first few months. I'll be honest I really struggle with the training aspect of it as I am someone who was lucky enough to be clever enough to get by easily throughout school so to now have someone constantly telling me what to do is tough! I like to be able to get on with my work without any distractions or input so the biggest thing I've had to learn is how to sit back, admit I don't know it all and let someone guide me. However I'm slowly coming out of that process now and the responsibility feels fantastic. Body. If you've followed me on twitter or this blog for a while then you'll know I've had a little battle with my weight and have been trying really hard to reach a certain weight by the time my Sister gets married in October. One morning last week I woke up, looked in the mirror and decided that actually, I'm pretty darn happy with how I look now. I posted a photo of James & I on Instagram from a wedding a couple of weeks back and despite my best attempts to pick apart how I looked, I actually think that I look really good and healthy! My bone structure means that I will never be a size 8 as I have naturally wide hips and broad shoulders, but all of my clothes are now a comfortable size 10 and I'm fed up of counting calories or punishing myself in the gym if I indulge. I let myself eat what I want but stay mindful that I am prone to putting weight back on. It's all about moderating and changing your entire lifestyle. I will no longer weigh myself, the only person who will see me on a scales will be my doctor and even then I don't want to hear it. My goal now is to shape up rather than lose weight and just tone what's already there. I've accepted that I'm at a really busy point in my life now and I was making myself miserable thinking that I was letting myself down by not going to the gym or eating 100% correctly. Life gets in the way sometimes and what's important to me now is finding a balance that I can maintain. A gym routine that I enjoy and want to take part in and a diet that isn't really a diet, it's simply eating right and not over indulging. Going to meet ups has to be one of my favourite things about being a blogger, and unfortunately living away from London means that sometimes we can get a little left out of some of the fabulous events shown. I was lucky enough to host my own meet up last year with a good friend and I really enjoyed the planning and organising of it. Now that I should hopefully have a little more time to myself I wanted to see if I could have another go. It'll be in Nottingham on the 1st August 2015, I'm hoping to get some things organised so will specify a time later. I'm only looking for around 20 guests as I think too much more can get a little too big and manic but I'll play it by ear! I can't promise overly lavish gift bags and talks from top Makeup artists etc but I will try my best to organise a day that's fun, relaxing and means that we all get to mingle with people who have similar interests and hopefully all get to do some shopping. If you'd like to be put on the list to attend, please tweet me with your blog's URL and email address, I'd like to keep all of the contact in one place if possible as it can get confusing if people are using every different platform to contact you! Once I have around the 20 people I'll start using email instead.